Manchester United fans have laid into Anthony Martial for his below par performance in Sunday’s goalless draw against San Jose Earthquakes. The former Monaco man, who is reportedly willing to leave Old Trafford, looked disinterested in what was going on around him. Playing in the number 9 position, Martial lacked the cutting edge as he struggled to play in a position he has not played in a while. With a host of regular players not in the pre-season tour of the United States, it had been expected of the talented youngster to make the most of the opportunities that will be handed to him. He also played as a left winger in the game, but it seems United fans have had it with his attitude. He has been linked with a move out of Old Trafford, has refused to sign a contract extension and is clearly not happy. The added fact that he resents Mourinho for benching him since the arrival of Alexis Sanchez in January. Here are some the best reactions to his below par performance. Think #mufc might need to sell Martial before his value drops. Terrible so far in pre season especially last night from what I see. Pretty much carried on where he left off last season….. He constantly lost possession, lacked energy and perhaps was still feeling the effects of not being part of France squad for the World Cup. Martial started last season like a house on fire but tailed off in the second half of the campaign. He is an attacking midfielder that can also play as a striker. He joined United in 2015 for £36m and has since scored 36 times in 136 matches. He has been linked to Chelsea as a replacement for Eden Hazard if the Belgian leaves for Real Madrid. 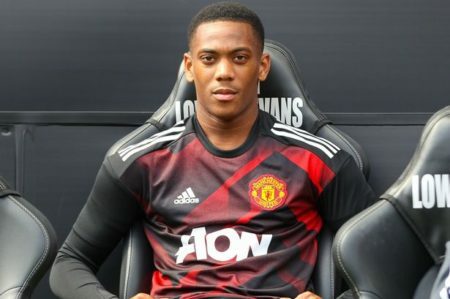 Mourinho’s questioning of Martial’s attitude has always been justified. Even Paul Scholes, who seems to enjoy criticising Mourinho, has condistently voiced concerns about his attitude. How much money is he on? How many of us would run through a wall EVERY DAY for half a chance to be where he is, with his talent, for half the money. He doesn’t get what an honour it is to play for United, let alone his pay, profile etc. If he don’t shape up, he needs to be binned (away from the Premiership mind) for as much as we can get for him. May even be worth a capped buy-back clause – just in case he grows up in time to realise what he’s letting go. He’s a Easter – hope he finds out the hard way.